The Metropolitan Atlanta Rapid Transit Authority (MARTA) is one of the top 10 transportation agencies in the U.S. 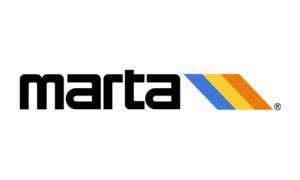 Formed in 1971 as a bus-only system, MARTA now consists of 38 rail stations, 570 buses and 211 mobility vehicles. MARTA transports 450,000 daily riders and 7.9 million annual passengers with service to Fulton, DeKalb and Clayton counties.